Quickly analyze and gain insights into network settings and controls to ensure you don’t have a bottleneck waiting to happen. Bring network configuration into alignment. Network misconfigurations and lack of alignment with best practices are often the root cause of application disruptions. It’s not always obvious that application performance is impacted by a lower-level setting in the shared network stack of a virtualized environment. And with the introduction of new capabilities in the network, the complexity of identifying issues in the network has been compounded. CloudPhysics network config health analytics ensure the structure and configuration of the network are correct and adhere to best practices. Network MTU Health: Avoid artificial bandwidth bottlenecks. Mismatched maximum transmission unit (MTU) sizes cause inefficiencies in network transmission and in some cases cause performance degradation and lost network connectivity. Ensuring devices along the path all have the same MTU size or above is tedious but important work. 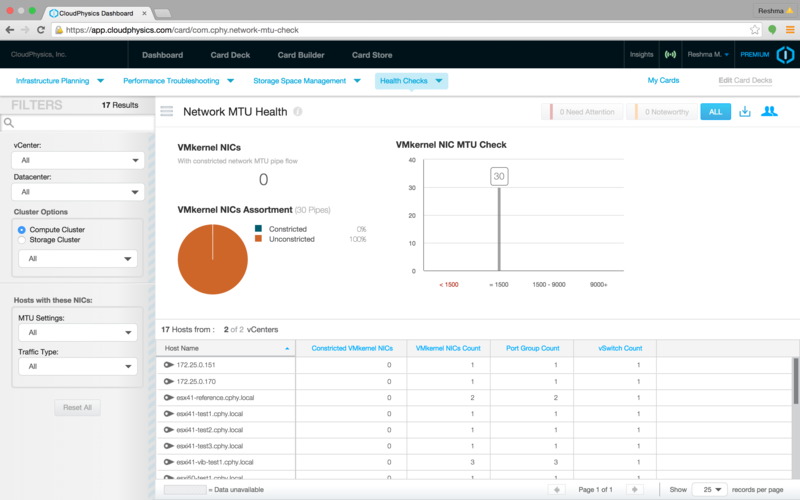 The Network MTU health card identifies mismatches between VMkernel NICs and the vSwitch, giving you the summary of all VMkernel NICs across all ESX hosts and highlighting MTU size mismatches and inconsistencies. Network I/O Control: Quickly analyze network controls. Available on vDS, NetIOC incorporates the network as a shared resource pool available to VMs through policy-based configuration settings. The Network I/O Control Card analyzes your configurations for controlling network traffic to align with VMware best practices to avoid bottlenecks during times of network contention. Network Shares and Limits: Gain insights into network resource pools. Analyze your NetIOC settings for shares and limits to conform to VMware best practices so that resource allocations on the network do not starve or thrash a VDS traffic set.